Obituary – Leonard, Alva (Kukuk) « Perry High School Alumni Association, Inc.
Alva L. (Kukuk) Leonard, 101, of Perry died Tuesday, March 21, 2017, at the Perry Memorial Hospital. 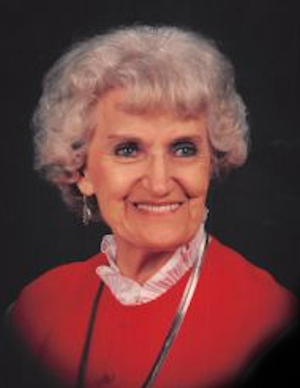 Alva was born in Perry on February 24, 1916, to Fred and Gerkee Kukuk. She grew up in a large farm family and attended Perry Schools graduating in 1935 from Perry High School. She later married Alfred Leonard in 1939 and they made their home in Perry. Alva was known for her great cooking and hospitality owning several restaurants in the Perry community over the years. She operated the well-known Rhoades Café, the Corner Lunch Café and was later the first to operate the Sooners Corner Restaurant we enjoy today. Her love for the outdoors she developed in her youth spanned into her adult life with her participation in the Perry Garden Club. She was known best for her 300 varieties of Iris’s in her back yard of her home in Perry. Many far and wide have enjoyed them over the years. She was a ”great” grandma. ”Gran” as she was known by, would cook for the boys and their friends during the Perry Jr. and Sr. High School Wrestling tournaments and provided a place for them to rest and hang out. She is survived by her two sons, Terry Leonard and wife, Judith of Perry, OK; Mike Leonard and wife, Jacque of Carrollton, TX; grandchildren, Chance and wife, Jo, Jason and wife, Jana, Shane and wife, Kelly, Ashley and husband, Rich Adkinsson, McKenzie and husband, Jake Motley. Great grandchildren, Luke, Ethan, Janson, Jentry, Beau, Blakey, Josh, Brooklyn, Peyton, and Paxton. She was preceded in death by her husband, Alfred and second husband, Raymond Smith, brothers and sisters and many cousins. Services for Ms. Alva Leonard will be Saturday, March 25, at 11:00 am at the Pavilion in Grace Hill Cemetery, Perry, OK. Visitation will be Friday, March 24 from 8:00 am – 8:00 pm. The family will receive friends from 6:00 – 8:00 pm on at the Brown-Dugger Funeral Home, Perry, OK.